Another month has passed with no rain and gloriously sunny days. It has been cold with frost most nights, but now the temperatures are beginning to rise, Spring is here. 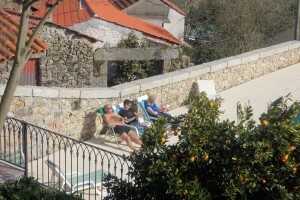 We had seven visitors from Holland for five nights, and they spent the afternoons sunbathing! This year of accidents seems to be continuing, we had another elderly lady fall over a terrace about three metres high. The ambulance was called and she went to hospital, not sure of the outcome yet, as we have not seen her since. Then a week ago, after I had gone to bed Lynn attempted to remove a metal band from a bottle top, with a sharp kitchen knife. The outcome was a visit to the hospital and four stitches. Our friend Hugh is currently in hospital recovering from a burst appendix. So here’s hoping again that, that is the end of it. It has been 3 weeks ago that we visited your beautifull apartments……and we miss it!! We had such a nice week, plenty of sun and four very nice orienteering races. To bad you had a few ‘troubles’ and I hope these were the last for this year. Wich Lynn all the best with here injury. Best regards from a rainy Holland.